The property conserves a full mile of Necanicum River frontage. 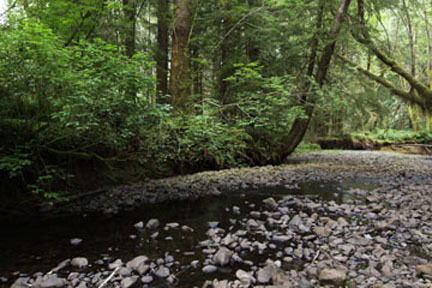 In December of 2010, after four patient years, three landowners, countless trips to the title company, a grant from the Oregon Watershed Enhancement Board and the help of two generous conservation buyers, NCLC finally acquired the 28-acre Necanicum Forest property adjoining Klootchy Creek County Park outside Seaside. This vibrant second-growth forest along the Necanicum River mainstem creates a contiguous 1.7 miles of conserved Necanicum river corridor and over 1/4 mile conserved along Klootchy Creek. Habitat type: Necanicum River riparian corridors; forested wetlands dominated by Sitka spruce.